If you've been following this blog for a few years, you will have seen the skincare brand Nuxe pop up a number of times in my beauty review posts. I went though a phase where I was obsessed with their lipbalm, then their moisturising mask and now it's the brand new Nuxe Aquabella range. It's the first time Nuxe have ever created a dedicated range of products specifically for combination/oily/teenage skin. It's a three step routine which is aims to give the skin a healthy, fresh and clear look, all while balancing moisture and oil control. I'll go through the products in detail below, but to give you a quick overview there's a Micro-Exfoliating Purifying Gel, an Essense-Lotion and a Moisturising Emulsion. It's a very straight forward routine and one anyone can follow! Ok, let's talk ingredients. Nuxe wanted to combine two natural ingredients - white waterlily and natural hyaluronic acid - so the areas of the face that needed hydration were boosted, while still offering a solution to the more oily areas too. So, what do the main products actually do? White waterlily helps maintain moisture levels as the flower naturally retains water molecules plus it helps to reduce bacteria from gathering and ultimately causing breakouts. Hydaluronic acid is, of course, has become a bit of a cult ingredient over the last year or so due to the way it holds moisture and stops it evaporating from the skin's surface. Nuxe have also patented their new Natural Blur Complex which is designed to naturally enhance the look of combination skin. This has three botanical active ingredients. First there's Oat Sugars which provide a smoothing effect on the skin. There's also Green Lentil Extract which reduce sebum and tighten pores, while also improving the quality of the skin's texture. Finally, theres Nasturtium Extract which improves the complexion's radiance by promoting oxygenation of the skin cells. This results in an immediate and lasting smoothing effect, as well as refining the skin to give it a fresh healthy glow, all while reducing shine. This easy to use gel is the first step in your skincare routine. It's a clear gel with tiny blue micro-exfoliating particles (natural, of course) which you emulsify over damp skin morning and night, then rinse off. I find this gel to be very easy to use and it doesn't take much effort to work it around the skin. the scent of it (and the whole range) is really nice, too, as it reminds me of the beach and fresh sea air - very refreshing on a morning! It's core active ingredients are white waterlily and the exclusive Natural Blue Complex, so it works to remove excess sebum while gently smoothing away any irregularities in the skin. It's not abrasive or irritating to the skin, just the right amount of light exfoliation you can use on a daily basis without causing any redness (at least on my skin it's been fine and mine is quite sensitive!). I do really like this Nuxe Purifying Gel and find it works great with my skin. I've been using it on a morning and as a second cleanse after removing makeup on an evening - plus it looks very snazzy in my shower as the packaging is a beautiful colour! When I had super oily skin and acne, I used to refuse to add moisture to my skin. I was convinced if I did, it would break me out and make my skin even worse. Little did I know (until later) that this was causing more harm than good and actually, keeping your skin hydrated makes a huge difference to those with combination skin. This lotion adds a big boost of moisture to the skin via it's active ingredients - white waterlily and natural hyaluronic acid. I am always so sceptical about lotions and sprays, but I was very surprised at the difference I noticed in my skin when I used this continuously. It looked more plump and radiant, as it improves skin texture at the same time as hydrating it. You apply it to a cotton pad, sweep over the face after you've cleansed and you're left with fresh and smoother feeling skin instantly. If there's one thing I hated when I had very oily skin, it was a thick moisturiser what would make your skin feel physically suffocated. Even now, with my skin being on the normal-combination side of the spectrum, I would rather layer moisture then put a heavy balm or cream all over my face. This is why I like this Nuxe moisturiser, as it's a light emulsion (as they call it) which hydrates the skin and gives it a very fresh look without it feeling overloaded. It does two things: hydrates the areas that need it and has a mattifying effect on the more oily areas (due to silica powder). This combination means your skin has such a natural smoothed, refined and radiant finish which is all anyone ever wants, isn't it? I've tried this moisturiser alone as well as mixed into oils and it works beautifully each time. My skin feels hydrated throughout the day and, as it comes in a handy pump bottle, you don't waste product or have to dip hands into pots (meaning it's more hygienic). Overall, a great moisturiser that gets the job done. 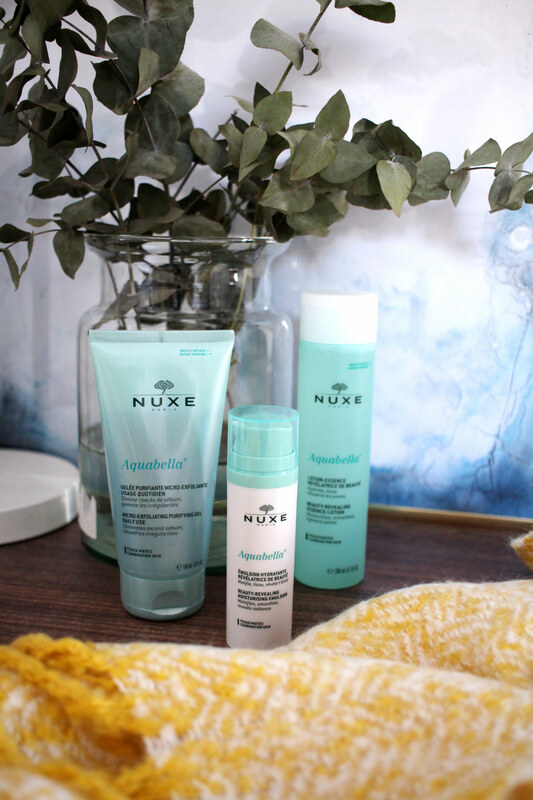 Overall I've been impressed by the Nuxe Aquabella range. I think it's great that they've focused their attention on a range for combination skin, as managing that skin type can be quite hard at times as you need to balance everything. As you can see below, using these products for a good few weeks has given my skin a natural radiance and glow, while still mattifying the areas that need it. I would definitely recommend this range if you have combination or oily skin! You can buy the Nuxe Aquabella range here.